By Dennis Zaki - Ethically corrupt governor Frank Murkowski failed miserably at the polls last night. Former Wasilla mayor Sarah Palin also, not so subtly, asked for Randy Ruedrichs' resignation. With Ballot Measure 2 passing, it seems Alaska has hit the trifecta for not taking lies and crap from blowhard politicians and large Outside corporations. Last week Murkowski's lapdog, chairman of the Republican Party of Alaska, Randy Ruedrich, leaked Sarah Palins' Social Security number, her birthdate, her drivers licence number, and her home address and telephone number. Classy guy. Ruedrich is Frank Murkowskis' right hand man. 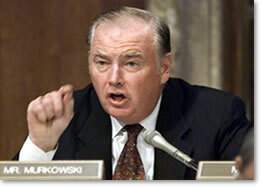 That says about all you need to know about Frank Murkowski. Palin got Ruedrich ousted from his job for ethics violations. Last but not least are the flat out liars honorable people over at the Northwest Cruise Ship Association who sponsored Ballot Measure #2. They first placed an ad in newspapers all over Alaska with the names of businesses they claimed supported their cause. The only problem about that was, they made it up. A whole flurry of companies complained because the NCSA added any old name they felt like it to the list without notifying them. 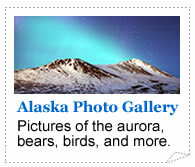 Then a NCSA spokesman claimed that 10 percent of all tourists would not come to Alaska if they had to pay a $50 tax. Yea right. Tourists paying $5000 A HEAD, just for the cruise, are going to haggle about another $50? Nice try. We know a lie when we see one. Then for a encore performance, one of their staff illegally set up three absentee voting stations to "help" employees cast their ballots. Busted again. Alaska is a better place today without these people pushing their BS on us. And with the cruise ships now having to pay corporate taxes, over $100 million richer.